"A pre-designed scenario is being implemented." On Friday, the Russian ambassador to the United States responded to the strikes by the U.S., U.K, France, and Israel in Syria by saying that Russia warned there would be consequences if such strikes occurred. "The worst apprehensions have come true," Ambassador Anatoly Antonov said in a statement. "Our warnings have been left unheard." "A pre-designed scenario is being implemented," Antonov continued. "Again we are being threatened. We warned that such actions will not be left without consequences." JUST IN: Russian Ambassador to U.S. on Syria strikes: "The worst apprehensions have come true...We warned that such actions will not be left without consequences." "The U.S.—the possessor of the biggest arsenal of chemical weapons – has no moral right to blame other countries." Britain, the United States and France launched more than 100 airstrikes in a “one time shot” against Syria early this morning to stop President Assad from using chemical weapons. It was double the firepower of a US attack against a single Syrian air base a year ago, James Mattis, the US defence secretary, said. The bombardment, which included US Tomahawk and British Storm Shadow cruise missiles, was fired at three targets linked to Syrian chemical and biological warfare operations, one on the outskirts of Damascus and the other two close to the western city of Homs. Gavin Williamson, the defence secretary, said the mission was “highly successful”. The strikes took place at 2am UK time despite warnings by Russia, a close ally of Syria, that its armed forces might shoot down incoming missiles and attack whoever fired them. Russia’s ambassador to Washington warned of “consequences” to the strike. President Trump announced the operation in a live televised statement. Theresa May, in a co-ordinated video clip, said there had been no alternative other than what she described as a “limited and targeted strike” to degrade the regime’s chemical weapons capability and deter their use. “This is not about intervening in a civil war. It is not about regime change,” she said. Describing the strikes as right and legal, the prime minister said that she believed military action was in Britain’s national interest. “We cannot allow the use of chemical weapons to become normalised within Syria, on the streets of the UK or anywhere else in our world,” Mrs May said. It is the first time that Mrs May has sent the military into combat as prime minister. “It is not a decision I have taken lightly,” she said. Loud explosions shook the Syrian capital as missiles struck a scientific research centre. 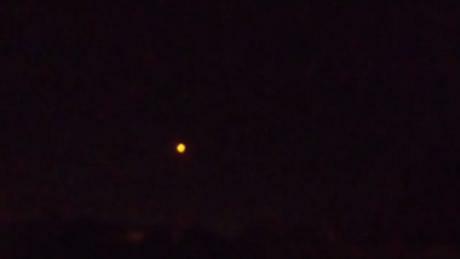 Heavy smoke could be seen rising into the sky, which briefly glowed orange. President Putin said Russia would convene an emergency meeting of the UN Security Council to discuss what he described as a western “act of aggression”. Any decision by Moscow to return fire would risk the seven-year Syrian conflict escalating into a wider confrontation between Russia and the West. 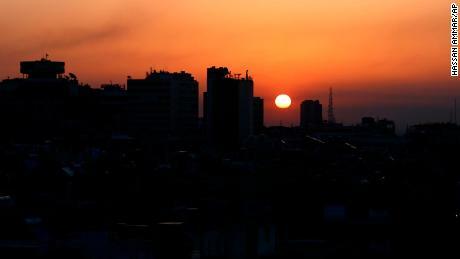 Iran, which also backs Damascus, condemned the bombardment. In a sign of growing distrust General Joseph Dunford, the top US military officer, said that the allies had chosen not to “pre-notify” Moscow about the details of the strikes, although this was disputed by France. Russia was told in advance of a salvo of 59 Tomahawk missiles launched by the United States last April. Today’s attack is the first multinational military action taken against the Assad regime since Syria collapsed into civil war. Great care was taken to avoid Russian or Iranian personnel or military hardware. Accidental misfires risk inflaming an already volatile conflict. Mr Trump signalled that Washington, London and Paris were prepared for a sustained effort until Assad stops gassing his own people. Mr Mattis, who spoke less than an hour after the president, did not rule out further strikes, but he noticeably refrained from repeating that the US was ready to “sustain this response”. Assad sparked global outrage a week ago following a suspected chemical weapons attack on Douma, a rebel-held town near Damascus. Mrs May said there is a “significant body of information including intelligence” that the Syrian regime was responsible. She said a regime helicopter was seen over Douma before the attack and evidence suggests barrel bombs, used only by Assad, were involved. Mrs May also drew a connection between the use of chemical weapons by pro-Assad forces and the nerve agent attack last month in Salisbury that the UK has blamed on Russia. Four Royal Air Force Tornado jets launched from an air base in Cyprus comprised the British element of the joint strike. They fired Storm Shadow cruise missiles against a military facility 15 miles west of Homs where it is suspected that the regime was unlawfully stockpiling chemical weapons precursors, the Ministry of Defence said. “The facility which was struck is located some distance from any known concentrations of civilian habitation, reducing yet further any such risk,” it said. All four crews returned safely, Mr Williamson said. 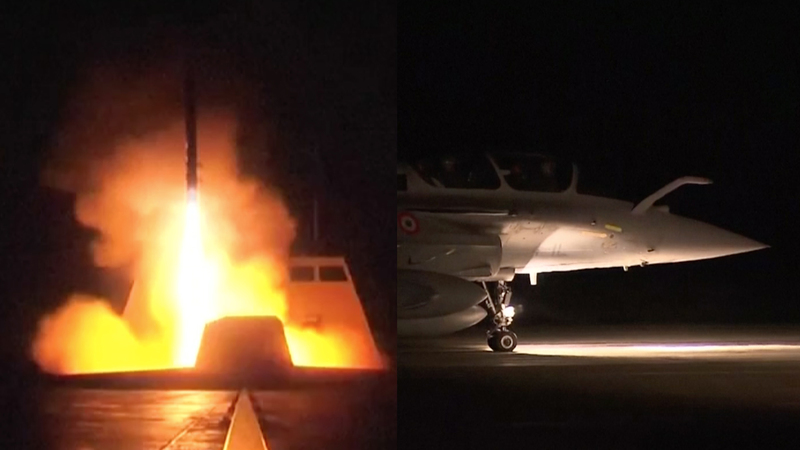 French Mirage and Rafale fighter jets were involved in the strikes. President Macron said a “red line” had been crossed after the attack in Douma. “We can not tolerate the trivialisation of the use of chemical weapons, which is an immediate danger for the Syrian people and for our collective security,” he said. The United States and its allies are bracing for a barrage of propaganda and false information from the Syrian regime and its supporters, Mr Mattis said. The Pentagon was expected to release further information on the operation to counter this problem later today. The Syrian military claimed most of the missiles were “effectively shot down”, including all 12 fired at the Dumayr airbase, east of Damascus. Brigadier General Ali Mayhoub told state television that one missile hit near Homs, wounding three civilians, with another damaging a research facility near Damascus. The airstrikes were launched five years after a US-led plan to bomb forces loyal to Assad for using poison gas to kill hundreds of people was aborted. That followed a failure by David Cameron to win parliamentary approval for an intervention. This time Mrs May resisted calls by Jeremy Corbyn to allow parliament a vote. MPs are expected to debate the action when they return from the Easter recess on Monday. Mr Corbyn called the action “legally questionable”. Ron Paul Rages: Assad Gassing His Own People Is "Total Nonsense"
The World Socialist Web Site condemns the strikes against Syria carried out Friday night by US, French and British forces. The attack is a flagrant and illegal act of aggression. The administrations of American President Donald Trump, French President Emmanuel Macron and British Prime Minister Theresa May are guilty of a war crime, which poses the danger of triggering a conflict with nuclear-armed Russia. The pretext for the attack on Syria is unproven allegations that Syrian President Bashar al-Assad’s military forces used banned chemical weapons against US-backed rebel militias in the city of Douma. Russia, which has significant military contingents in Syria to support Assad’s government in its seven-year civil war against predominantly Islamist-based militias, has categorically rejected the US and allied propaganda. It has openly accused British intelligence of pressuring Syrian rebel organisations to manufacture a video that purports to show victims of a chemical weapons attack. A team from the ostensibly independent Organisation for the Prohibition of Chemical Weapons (OPCW) was scheduled to arrive in Douma to carry out an inspection of the alleged site this weekend. Trump’s order to initiate strikes was calculated to pre-empt such an inspection and a confirmation by the OPCW that the entire pretext for any attack on Syria was a lie. The fraudulent basis for the assault was underscored shortly after Trump’s broadcast, during the subsequent press briefing by his defense secretary, General Jim Mattis. Mattis could not provide any coherent details as to the US accusations. Moreover, contradicting the president’s vow of a protracted campaign against Syria, the general appeared to indicate that there would be no more action apart from the missile strikes that had already taken place. If this does prove to be the case, the action ordered by Trump will fall far short of what was being demanded within the American political and media establishment. Given the extreme vitriol directed against Bashar al-Assad, there is no doubt that advocates of a military strike expected that any attack would include an attempt to assassinate the Syrian president. A column in the German journal Die Welt provided one indication of the homicidal nature of what large sections of the imperialist ruling class internationally want to be unleashed against Syria. It declared: “War against Assad should be guided by one goal… Can the Assad regime be exterminated (auslöschen) with a missile strike?” In using the term “auslöschung” to refer to the Syrian president, the German publication adopted a term associated with the extermination of the Jews under the Nazis—that is, it is using language that could have appeared in Hitler’s Völkischer Beobachter . Far from the destruction of the Assad government, however, the strike against Syria appears to have minimal impact. The Russian military has boasted that Syrian air defenses shot down most of the missiles fired into Syria and that none of its personnel or assets in the country were impacted. Bashar al-Assad reportedly walked to his office on Saturday morning. At this point, the attack has served primarily to underscore the debacle facing the US-led imperialist intrigue for regime-change in Syria. It will most likely not be long before sections of the American political and media establishment are accusing Trump of a climb-down and capitulation to Vladimir Putin. Demands will inevitably be made for far more extensive, and murderous operations. The propaganda campaign justifying the attack on Syria was concocted to provide a pretext for a massive military onslaught—not one-off missile strikes. Facing the prospect of a military rout of its Islamist proxy forces fighting to overthrow the Syrian government, the decision for an escalation was made in Washington and London, and it was left to the CIA, MI6 and their Syrian agents to manufacture a pretext. On Friday, the Russian Ministry of Defense provided the most coherent and logical account given so far regarding the incident in Douma on April 7, which the Western press has unanimously proclaimed a chemical weapons attack on civilians by the Assad government. “We have irrefutable evidence that it was another staged attack, and the special services of a state which is in the forefront of the Russo-phobic campaign had a hand in staging it,” Russian Foreign Minister Sergey Lavrov said. The Russian Defense Ministry showed a video interview with two people, one of whom was a medical student working at Douma’s only operational hospital. The witnesses said that after a Syrian Army artillery barrage hit a building, people suffering from smoke inhalation were being treated at a hospital. Then, unknown individuals—later revealed to be associated with the CIA-backed Syrian rebel “White Helmets”—ran into the hospital screaming that there had been a chemical weapons attack. They encouraged the victims to douse each other with water, which they then proceeded to film. With the initiation of attacks on Syria, the US and its allies have signaled that the unravelling of the nominal reasons for war is irrelevant. Their onslaught is driven by far deeper causes than the lies used to justify them. What is taking place is directly in line with the analysis of imperialism made by the great 20th century Marxists, Lenin and Trotsky. World imperialism is undertaking a new re-division of the world. Britain and France want to be recognized as full-scale participants in the new carve-up of the Middle East and its effective recolonization: their oil corporations do not want to be left out of the plunder. All of the governments participating in this new onslaught are crisis-ridden and lack any electoral legitimacy. The vast gulf between them and their populations is expressed in the fact that none of them has been able to create any broad-based support for war. According to one YouGov poll, only 22 percent of the British population support a military strike on Syria. Moreover, the launching of a major new military campaign is seen in London, Paris, and Washington as a means of implementing police-state rule, including mass censorship, to prop up their crisis-ridden governments in the face of mounting popular opposition and a growing strike movement by the working class. This new conflict will not stop with the attack on Syria, just as the expansion of war did not stop with the invasion of Iraq. The stage is being set for a confrontation with Iran, Russia and, ultimately, China. More and more, imperialist policy is acquiring a completely reckless and unhinged character. So far, the ruling class has been able to rely on the absence of any organized resistance to war. But popular anti-war sentiment will inevitably take on active forms and meet up with rising opposition to austerity and the destruction of democratic rights. Washington (CNN) The US, UK and France launched strikes against targets at three sites in Syria in the early hours of Saturday morning, following a week of threats of retaliation for an alleged chemical weapons attack on civilians in the Damascus enclave of Douma. "I ordered the United States armed forces to launch precision strikes on targets associated with the chemical weapon capabilities of Syrian dictator Bashar al-Assad," Trump said late Friday at the White House. The strikes were launched at 9 p.m. ET, as most of Europe and the Middle East was shrouded in darkness. 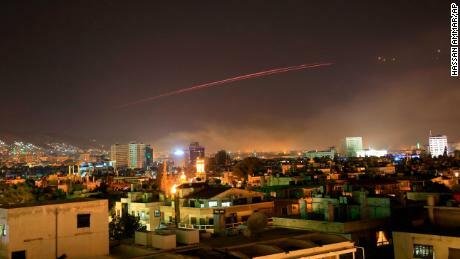 Photos showed missiles streaking over the night sky in Syria, and witnesses told CNN they heard explosions in the capital Damascus as Trump was making his address. The Syrian Armed Forces said in a statement that 110 missiles were fired on Syrian targets and that the country's defense systems "intercepted most of the missiles, but some hit targets including the Research Center in Barzeh." Russia's news agency TASS reported that none of the missiles fired by the three western nations struck areas near its naval and air bases in Syria. Those bases come under the protection of Russian air defense units. Three civilians were wounded in Homs after "several" missiles were intercepted by Syria air defense systems, Syria State TV said. 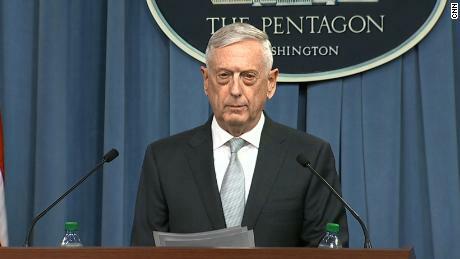 US Defense Secretary James Mattis said "right now this is a one-time shot and I believe that it sent a very strong message" to the Syrian regime. Russian Foreign Ministry spokeswoman Maria Zakharova said the US strikes had hit the Syrian capital when the country "finally" had a chance at peace. Iran's Foreign Ministry condemned the strikes. "The attack is the blatant violation of international laws, as well as ignoring the sovereignty and territorial integrity of Syria," foreign ministry spokesman Bahram Qasemi said according to Iran's state news agency. Australia's defense minister issued a statement in support of the strikes, calling them "a calibrated, proportionate and targeted response." US defense and military officials told CNN that aircraft, including B-1 bombers, and at least one US Navy warship based in the Red Sea, participated in the strikes. Gen. Joseph Dunford, chairman of the US Joint Chiefs of Staff, told reporters at a Pentagon briefing that the first allied strike targeted a scientific research center in greater Damascus involved in the development and production of chemical weapons. The second site targeted was a chemical weapons storage facility west of Homs, while the third was at a chemical equipment storage facility and important command post. 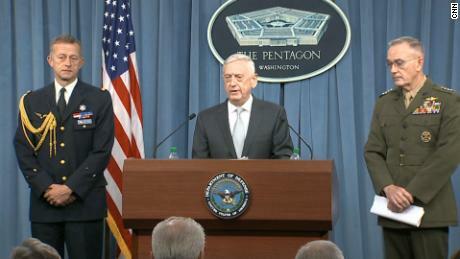 "Important infrastructure was destroyed which will result in a setback for the Syrian regime. They will lose years of research and development, storage and equipment," Dunford said. Trump said that he decided to take action because last weekend's action by Assad "was a significant attack against his own people," and "not the actions of a man, they are crimes of a monster instead." Trump said the strikes were in coordination with France and the United Kingdom, adding that the purpose of the campaign is to "establish a strong deterrent against the production, spread and use of chemical weapons." "The combined American, British and French response to these atrocities will integrate all instruments of our national power: military, economic and diplomatic," Trump said. UK Prime Minister Theresa May said in a statement that she "authorized British armed forces to conduct coordinated and targeted strikes to degrade the Syrian Regime's chemical weapons capability and deter their use." After Syria strikes, now what? "The UK element of the carefully coordinated joint action was contributed by four Royal Air Force Tornado GR4s," a statement from the UK Ministry of Defense said. "They launched Storm Shadow missiles at a military facility -- a former missile base -- some 15 miles west of Homs, where the regime is assessed to keep chemical weapon precursors stockpiled in breach of Syria's obligations under the Chemical Weapons Convention." French President Emmanuel Macron said he "ordered the French armed forces to intervene" after a "red line set by France" on the use of chemical weapons had been crossed. The office of the French President posted a video of a squadron of French military jets taking off to launch their part of the strikes. Trump indicated the strikes would continue until the Syrian regime's use of chemical weapons ends. 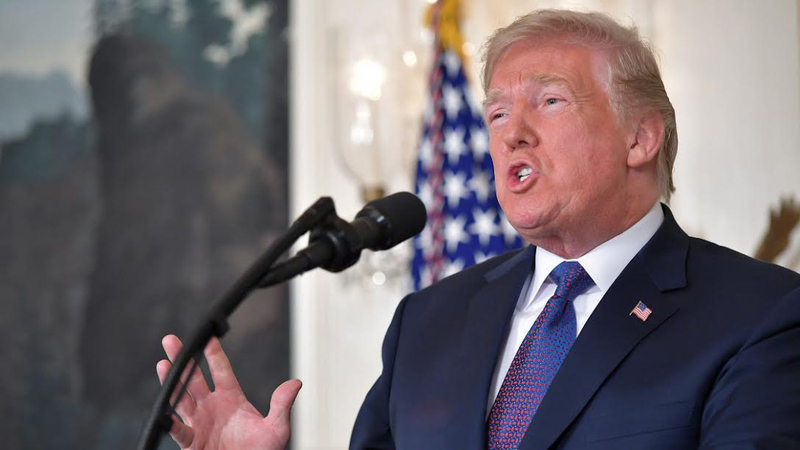 "We are prepared to sustain this response until the Syrian regime stops its use of prohibited chemical agents," he said. 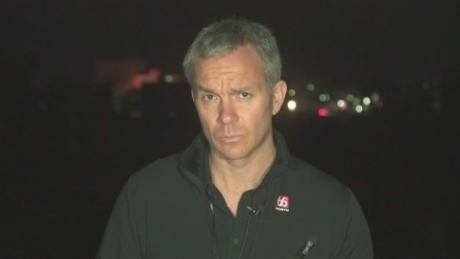 A senior administration official said "what you've seen tonight is not the end of the US response. They have built a lot of flexibility into the plan to allow for further strikes based on what they've hit tonight." However, Trump added the US "does not seek an indefinite presence in Syria." He has previously told his national security team he wants US troops to exit Syria within six months. Early Saturday UN Secretary General António Guterres called on members of the Security Council to show restraint to avoid escalating the conflict. Russian Foreign Ministry spokeswoman Maria Zakharova said the US strikes hit when the country "finally" had a chance at peace, she posted on Facebook Saturday. "One must be really exceptional to strike Syria's capital when the country finally got a chance for a peaceful future," she wrote. The Russian Embassy in Washington tweeted a statement attributed to Ambassador Anatoly Antonov that said "our warnings have been left unheard." "A pre-designed scenario is being implemented. Again, we are being threatened. We warned that such actions will not be left without consequences. All responsibility for them rests with Washington, London and Paris," Antonov said. Trump earlier criticized Russia's support of the Syrian regime saying "Russia must decide if it will continue down this dark path," adding Russia had failed in its 2013 promise to eliminate Syria's chemical weapons. Part of the calculation this week has also been gaming out how Russia will respond. "We are watching what Russians do in the next 24 hours," the official said, adding that there will be intelligence collection to see what Russians are up to in the wake of the strikes, such as turning on their systems or talking about retaliating. Joint Chiefs Chairman Dunford said the US "specifically identified" targets to "mitigate the risk of Russian forces being involved" and that the normal communication line to avoid problems in the airspace over Syria was used in the run up to the strike. "We used the normal deconfliction channel to deconflict airspace, we did not coordinate targets," Dunford said. The Russians were warned beforehand, said French Defense Minister Florence Parly at a press conference on Saturday. "We do not seek confrontation and we refuse any possibility of military escalation and that is the reason why, with our allies, we have insured that the Russians were warned beforehand," she said. 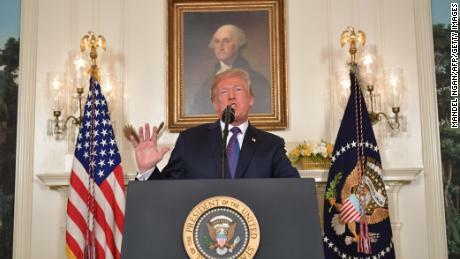 An Israeli official told CNN that the strikes enforced the red line drawn by President Trump last year. "Syria continues to engage in and provide a base for murderous actions, including those of Iran, that put its territory, its forces and its leadership at risk," the official said.